I'd like to do a series of recipes with Cast Iron cooking. I have never had a dutch oven before and always wanted one. I finally got one this Christmas and was so excited to think now I can make an entire meal at one time. My mom in law uses her dutch oven all the time and it just makes the whole house smell heavenly. Once I got mine all seasoned and ready to go, I tried making the whole chicken and all the fixings. And, as you can see from above, it turned out delicious and extremely moist. If you never had a dutch oven, you first have to season it. Turn on your oven to about 300 degrees, rub your pan down with shortening or oil. Bake for about 2 hours, remove from oven and wipe out. I did mine a few days prior to baking the chicken. So, I put my chicken into the pan, rub a dollop of butter all over the entire chicken, season to taste, then added my chicken broth. Placed the pan into a 375 degree oven and baked it for about an hour and a half. 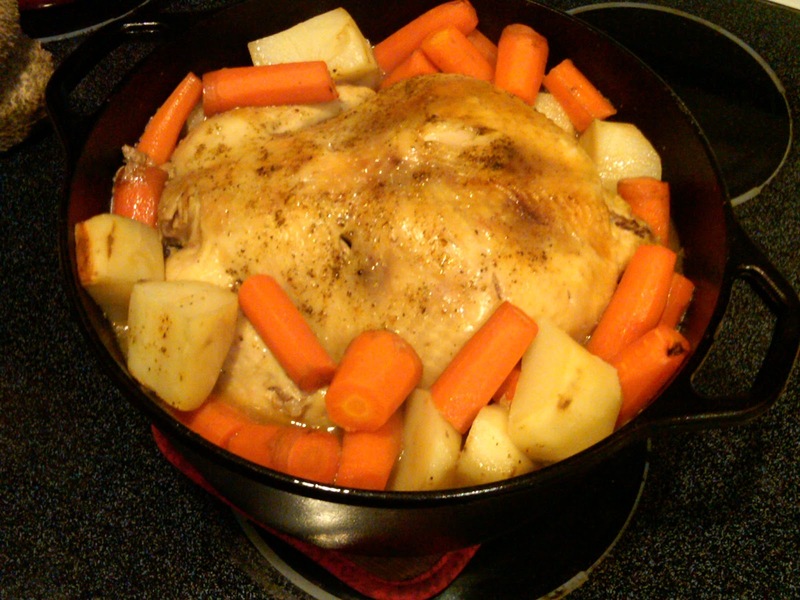 Pulled it out and added the carrots and taters and then placed back into the oven and baked until chicken was golden brown and the veggies were fork tender, about another 1 to 2 hours. It was sure mighty tasty. I made a pan of biscuits to go with it and viola my dinner was made. I love cast iron, too. It makes incredible pizza dough, in the 'round' or cornbread. Yum!